The Linksys Smart Wi-Fi web interface of your router can be accessed through the local access link on the Login page. The steps below will guide you on how to access the Linksys Smart Wi-Fi Router settings without creating Linksys Smart Wi-Fi Account and signing in. 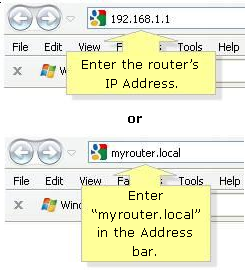 In the Address bar, enter your router’s IP Address or “myrouter.local” then press [Enter]. NOTE: The default IP Address of the router is 192.168.1.1. If you changed it, enter the new IP Address instead. QUICK TIP: If a Bad Gateway Error occurs when accessing a Linksys Smart Wi-Fi Router, click here for the solution. When the Linksys Smart Wi-Fi Account login appears, click the local access link below the Sign In section. Enter your Router Password in the space provided and click Sign In. NOTE: The default password is admin. If you changed it, enter the new password instead. Wait until you are redirected to the user interface of your Linksys Smart Wi-Fi Router. NOTE: The Device List is displayed as the Network Map Tool on some of the Linksys Smart Wi-Fi Routers. The External Storage is displayed as USB Storage among Linksys Smart Wi-Fi Routers with older firmware version. You should now be able to change or personalize your router and network settings.